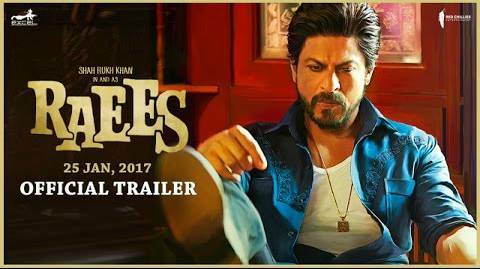 Raees Movie Trailer: The official trailer of Shah Rukh Khan Starrer “Raees” has been unveiled and it runs high on action, drama and romance as seen in the over 2-minute’s video.The Rahul Dholakia’s directorial stars Shah Rukh in an intense role and it can be seen in the trailer too. On one hand, SRK is showing some daredevil fight scenes and on the other hand, his romantic side has been captured well with Pakistani actress Mahira Khan, who plays the female lead in the film. The trailer also showed a glimpse of actress Sunny Leone, who is seen grooving to new take on the 1980 chartbuster “Laila O laila” from “Qurbaani”. The song is picturised on SunnyLeone and Shah Rukh Khan.The Raees film is said to be based on the life of a city-based underworld don of the 1980s, Abdul Lateef Shaikh, who was killed in a shootout with the police. The Raees movie will hit theatres on 25th January 2017 clashing with Hrithik Roshan’s ‘Kaabil‘ Movie.